Venus gleams low in the west and gloom deepens under the trees along Northwest Branch Trail. During mile 2 it's hard to see the bumpy asphalt through glowing afterimage-like blobs (ocular migraine effect?) but eventually they fade. 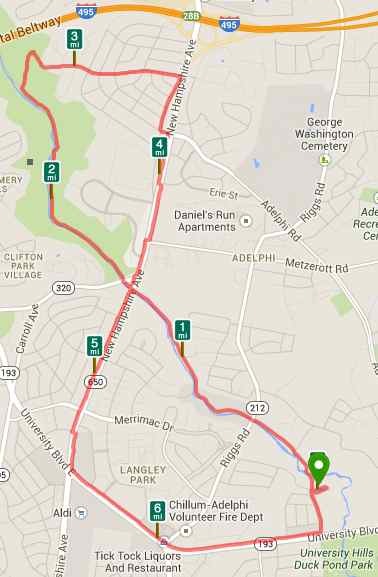 The steep hill climb to Oakwood Dr is at paved path's end just inside the Beltway, past a cluster of girls wearing headlamps (a cross-country team?). The return trip is via sidewalks along busy New Hampshire Av & University Blvd, dodging cars at crosswalks and driveways.